The Avatar Menu is a multiplayer game mode in Kingdom Hearts Re:coded that borrows many elements from Kingdom Hearts Mobile, with the addition of the "Avatar Sector" (アバターシステムエリア, Abatā Shisutemu Eria?, lit. "Avatar System Area"). The Avatar Menu is subdivided into "Customize Avatar", where the player can design their personal avatar, "Avatar Sector", the special 100-floor System Sector, and "Tag Mode", which allows the player to send and receive Balloon Letters. The "Customize Avatar" menu houses the Avatar Parts, a feature based upon the avatar system in Kingdom Hearts Mobile. The name and signature of the player's avatar is taken from the DS's own name and signature, but the avatar's design is pieced together from the Avatar Parts. There is a total of 815 Avatar Parts for the player to collect, consisting of various pieces of clothing and body features, and 93 "Ensembles" which allow the player to place a coordinated set of parts at the same time. The player starts with all of the parts from "Bods", "Lips", "Peepers", the eight Cowlick parts, Typical Top, Basic Bottoms, and Starter Shoes, one random "Ensemble" and all of the parts it contains, and one random part each from "Hair", "Features", "Scars, Etc. ", "Coats", "Starter Kits", "Tops", "Bottoms", "Shoes", "Hats", "Face & Neck", "Mitts", "Rear Gear", "Belts", "Items", "Buddies", and "Bodysuits". There are also eight Avatar Parts which are awarded for obtaining a set amount of Trophies; the "King Mickey's Hair", "King Mickey A's Shoes", "King Mickey A Outfit", "King Mickey's Tail", "King Mickey's Gloves", "King Mickey B's Shoes", "King Mickey B Outfit", and "King Mickey Ears" are given for obtaining 2, 5, 8, 12, 16, 20, 25, and 30 trophies, respectively. Every other piece is obtained randomly through clearing the challenges in the Avatar Sector, or as a random prize from Scratch Cards. The Avatar Sector is a special System Sector that is built by the player, one floor at a time. Unlike other System Sectors, the Heartless within grow progressively stronger the deeper Data-Sora dives in; excluding the Gold Tricholoma, Eliminator, and Data-Riku, the enemies's levels are equal to the floor number. The Avatar Sector has a maximum of one hundred floors, and ninety of them must be obtained from Balloon Letters in Tag Mode. These floors can be deleted by the player at will, and if the player keeps obtaining Balloon Letters once the Avatar Sector is complete, the lowest floor will be deleted to make room. Each floor is represented by an avatar, either one of the fifty prefabricated avatars, or a random avatar made from mixed parts. 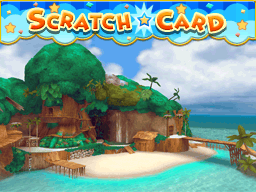 Each time Data-Sora clears one of these floors while fulfilling its associated challenge, he will win an Avatar Part, starting with those the floor's avatar uses, and then random pieces once those have been exhausted. 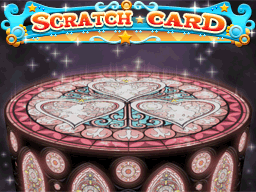 For every nine floors obtained from Scratch Cards, the Avatar Sector will automatically add a special tenth floor that has an SP challenge. The ten SP challenge floors eventually culminate in a battle against a bugged Data-Riku. In addition to Avatar Parts, the Avatar Sector has its own list of Sector Rewards, which grows as Data-Sora goes further into the Sector. Furthermore, Data-Sora is given a title based on how far he has gone into the Sector. Tag Mode (すれちがい通信, Surechigai Tsuushin?, lit. "Passing Communication") is a communications system which allows the player to obtain Balloon Letters (メール, Mēru?, lit. 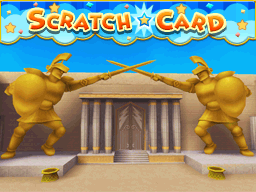 "Mail") from other avatars, which contain Avatar Sector floors and Scratch Cards. To enter Tag Mode, the player must choose which Floor Code and Floor Challenge they would like to share; these lists are initially short, but once the player has completed the Avatar Sector, they will be able to share any of the Floor Codes and Floor Challenges which appear in the Avatar Sector, excluding the Boss Floor Code. The Avatar Sector floor contained within the Balloon Letter is automatically added to the Avatar Sector, whether the Balloon Letter and Scratch Card are opened or discarded. Balloon Letters can be given by a friend's avatar, a fixed avatar, or a random avatar. When the player receives a Balloon Letter from a friend who is also playing Kingdom Hearts Re:coded, the two players will share their personal avatars, and whichever Floor Codes and Floor Challenges they selected. If Tag Mode has been used for a suitably long interval, usually an hour or two, the player can also receive an avatar constructed from random Avatar Parts; this avatar's name and quote will reference each other, but not its appearance or any of its stats. More infrequently, a fixed avatar will appear in place of the random avatar. If the player enters Tag Mode while receiving a DS-compatible wireless signal that is not from another Kingdom Hearts Re:coded game (for example, if it is receiving a broadcast from the Wii's Nintendo Channel, or from another DS's PictoChat), they will immediately receive a fixed avatar, whose quote and other stats are references to the character the avatar depicts. Balloon Letters received this way are generated by the compatible wireless signals; the more signals the DS is receiving, the more Balloon Letters will be received in the same amount of time. While the player can generally receive only one of each of the fifty fixed avatars, the random generator for the fixed avatars is based on the DS's internal clock, so if the DS receives multiple wireless signals and generates more than one Balloon Letter at the same time, it is possible to receive multiple Balloon Letters with the same avatar. (>_<)/RAGE Back off! I'm angsty! $$$Grubber Munny is mah hunny. 10derMemry It's great to be a kid. 1WhoGetsIt Shh! No more words. 2Good2BTru And too true to be good. ∞Lives I totally 1-upped you. A♭OutLie Don't believe a word o' me! BigBrudda 'Sup, bro? Need a hand? Don'tASCII It's a SCSI story anyway. Dude!ItsMe Y'know? From the thing? FlyOnDWall The real bug in this tale! HeyIKnowU Long time no see! LivNLegacy Oh. You're not gone yet? Masker8dr No one knows my REAL name. MeIfIWereU Chew on that. Deep, huh? Miracle2Go May I take your order? Ninja(shh) You did not see me. No1UKnow So let's keep it that way. NotTe11ing ...Unless you ask nicely. Omigoddess I'm, like, a divine ditz! OozinCharm Grab a mop. OC's in town! ORLY_YARLY Will my life have meaning? P00rPuppet Always being strung along. PassNDream Enjoy me while I last. Pure^_^Joy With plenty to go around. PureRandom Nothin' to see, folks! ROFLCopter Hey, do you LOLerskate? Sdrawkcab Ereh sedoc terces on! Sh8pShiftR I'm really a triangle. ShadyNomad I don't like the sun, OK? The 1nk1ing Did I jog your memory? The" "One I dunno why you " " me. TheOne4U U is the best letter EVER. TimeTravlR The 21st century? Retro! TwixtTween Always stuck in da middle. U.Know.Who Don't pretend you don't. Un4Gettabl It's my memorable face. UnsungHero No one ever sings for me. UR<3sDzire And now, I can be yours. UrPastLife You're me but I ain't you. UrTrueSelf Reunited at last, eh? UsualNon¢s Penny for yer thoughts? WhatUWere No escaping your past! Use a Megalixir, the mega-fixer! Take out tons of Heartless for me! Use a Finish command ASAP! Red + shield = baaaaaad news! Get rid of that gold pest! Try not to take damage! Nothing beats a game before bed! This is no time to stand around! Move, move, move! Time's a wastin'! Blow enemies away with air-tosses! Rock out with well-timed blocks! Put those pesky foes on ice! Rack up SP. That's all there is to it! No bashing blox! They have feelings! Fight with only magic commands! Only attack when you have to! Burn, baby! Light those foes up! Counterattack like you mean it! Hope you're good at critical hits! Dare ya to defeat foes in one blow! Weekends are made for gaming! Fight with just attack commands! Bash as many blox as you can! Keep nailing those Finish commands! Smash away with MAX overclock! Clean up while it's still light out! Feeling grabby? Grab lots of items! 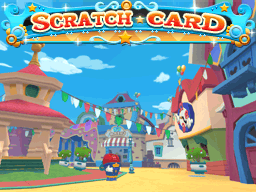 Scratch Cards are one of the prizes attached to Balloon Letters. 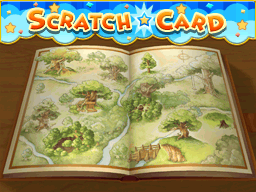 Every Scratch Card is set in a specific world, as specified by the background, and contains several hidden icons depicting characters from that world. The cards also list a "Character Hunt" (キングダムスクラッチ, Kingudamu Sukuracchi?, lit. 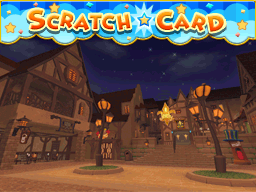 "Kingdom Scratch") that requires the player to uncover a set amount of a specific character within a set amount of chances, and almost always lists a "Bonus Hunt" (ボーナススクラッチ, Bōnasu Sukuracchi?, lit. 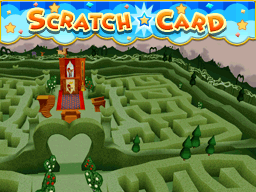 "Bonus Scratch") as well, which requires the player to uncover a single, specific character; the exceptions are the character hunt on the "Villains Card", where the player must not uncover Chernabog, and the character hunt on the "Princess Card", where the player must uncover one and only one each of the seven Princesses of Heart. In addition, if the avatar has a Buddy part, the Bonus Hunt will be replaced by an "Avatar Hunt" (アバタースクラッチ, Abatā Sukuracchi?, lit. "Avatar Scratch"), which consists of uncovering the buddy's icon. 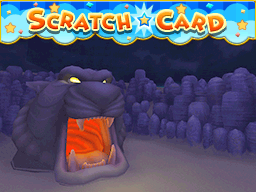 Clearing a Character or Bonus Hunt will result in Data-Sora winning a random command or Avatar Part; the class of Command or Avatar Part is dependent on the Scratch Card type and which hunts are completed, and it is even possible for the Avatar Part to be one that Data-Sora already has. In addition to the basic icons, there are three special icons: Dalmatian puppy, Mickey, and Captain Dark. Dalmatian puppy: Activates "Lucky Puppy! ", which adds a puppy to Data-Sora's total. Once Data-Sora rescues all 99 puppies, he is rewarded with D-Firaga. 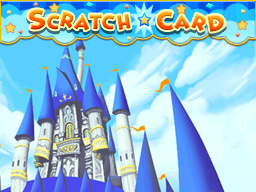 Mickey: Activates "Bonus Chances", which adds one to three extra chances to Data-Sora's total. Captain Dark: Activates "Sneak Peek! ", which allows the player to see all the character icons, uncovered for 1.5 seconds. Balloon Letters have more benefits than simply getting Scratch Cards, however. Each Balloon Letter received can increase the avatar's Happiness (ハッピ一度, Happī-do?, lit. "Happy Points"), which ranges from 0 to 100, as long as the attached avatar shares parts with the player's avatar. 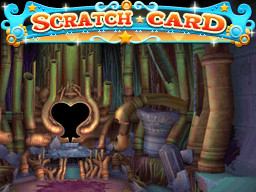 Having high happiness increases the chances for Balloon Letters to include special icons and Scratch Cards, and when it is at its highest level, indicated by hearts surrounding the avatar, Data-Sora's own Luck is doubled; getting this boost is actually the only way to raise his Luck to its maximum of 28. However, opening more Balloon Letters also increases the chances that the next Balloon Letter will infect your Avatar Sector with a virus. The probability of a letter carrying an infection is , where is the base probability the letter is infected (1% for letters from fixed avatars, random avatars, or infected friends; 0% for letters from uninfected friends), and is the number of letters that have already been opened. That outfit! Ugh, don't make eye contact... ? Err, can you say "awkward"? ? Hopefully a friendship is in the cards. ? But...which one of you is cooler? ? You hate to admit it, but that outfit's the bomb! ? Have you met before? You're pretty happy! ? You have alot in common. You're pretty happy! ? You sort of think alike. You're pretty happy! ? Seems you two get along. You're pretty happy! ?